Have you ever written passionately about something you care about, and then been sort of disappointed in the final product? In a vicarious way, that’s how I feel about Jeff Schmidt’s book Disciplined Minds (Lanham MD: Rowman & Littlefield, 2001). Disciplined Minds is about the negative consequences of socialization – that is, how we learn to fit into our social groups, organizations, schools, and so on. Schmidt focuses in particular on the conformity required by all of the white-collar professional disciplines, and stresses that “discipline” implies both specialized knowledge and acceptance of professional norms that are essentially political. The book’s perspective is quasi-Marxist, in that Schmidt views the tension between systems and their authority figures on the one hand, and individual professionals or professionals-in-training on the other, as an inevitable class conflict in which individuals are in danger of being trapped, crushed, and oppressed by the larger systems of which they are a part. I agree with about two-thirds of this. For example, I’ve sometimes half-joked that universities are basically concentration camps for smart people, and operate as if designed to prevent potentially creative people from bringing about any fundamental change. Schmidt’s perspective would resonate with this metaphor. However, Schmidt does not appreciate psychology very well, and fails to see the variations in quality that exist among organizations and among individuals. In railing against corporate pressures toward uniformity, he has written as if all systems were equally oppressive and as if all individuals were equally susceptible to the same threats. Martin Luther King is an example of a post-Marxist leader who was more appreciative of individual strengths and weaknesses and of the potential for getting leaders to change. Just saying. 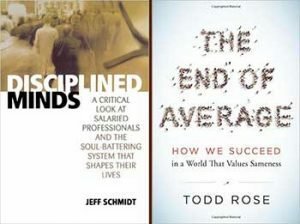 A good book to read in conjunction with Disciplined Minds is Todd Rose’s The End of Average. Rose attacks the general notion that averaging several particular scores provides a way of discovering what is typical, or ideal. In very simple situations, averaging can be a good tool. However, Rose argues that society overuses “averagarian thinking,” and in the process fails to appreciate the value of individual variation, what he calls the jaggedness principle. His analysis provides a deep critique of practices such as reducing student or worker performance to a score, and then characterizing the individuals themselves as above or below average. Such an approach misses so much about the individual person that I don’t know whether to call it tragic or absurd. The End of Average attributes the prevalence of averagarian thinking to Taylorism. Frederick Winslow Taylor (1856-1915) was a pioneering data-driven efficiency expert, the Billy Beane of his day. Taylorism is an approach to organizing factories, corporations, and schools mechanistically, with goals set and performance measured in terms of simple averages. The workers in a Taylorist company are treated as interchangeable parts of a large machine, and their one economic value is the contribution they make to the “bottom line” performance of the machine as a whole. Such is the profit motive. Rose’s book, The End of Average, explains more specifically what is wrong with the disciplines and systems that Schmidt complains about in Disciplined Minds, and goes further to show how the individuality of real people can be taken into account in furthering their quality of life and the success of their groups and organizations. He provides examples of businesses that have rejected or revised the Taylorist approach, and of educational practices that approach learning in terms of individual development, not just external norms or criteria. Rose’s analysis could be taken further, into psychological theory. Each individual mind is undeniably different, yet textbooks routinely assume that there are processes of concept formation and knowledge acquisition that work in the same way for everyone, with the possible exception of minds broken so as to be deficient, or gifted so as to be “above average.” What if the details of understanding were really different in everyone? What if we gave more credence and acted with more acceptance of these differences? For example, my students and I found that if you ask 100 people to each write down their own definition of violence, you will get 100 different definitions. The “meaning” of violence as given in a dictionary is not the same as the “understanding” of violence that each person carries around with them, and presumably uses in deciding how to act and how to respond to the actions of others. Neither the dictionary nor an average of those 100 definitions will be informative about what violence is to real people. So Schmidt has written a book that is at least half true, but that falls into some old traps. Rose has written a book that can help to repair some of the deficiencies in Schmidt’s book. Both books are worth reading, and I’m hopeful about the direction in which this whole conversation is going.